Raynham Hall Museum historic house which served as a British headquarters during the Revolutionary War is the home of America's first documented Valentine. On February 14 over two hundred years ago, Lt. Col. John Graves Simcoe of the Queens Rangers asked Sarah "Sally" Townsend to "choose me for your Valentine!". Raynham Hall Museum, which served as a British headquarters during the Revolutionary War, can lay claim to a truly historic "first" - it is the home of America's first documented Valentine. On February 14 over two hundred years ago, Lt. Col. John Graves Simcoe of the Queens Rangers asked Sarah "Sally" Townsend to "choose me for your Valentine!". In 1914, Julia Weeks Coles (niece of Helene DeKay) and her sister Sallie Townsend Coles purchased Raynham Hall for $100 to preserve it from change. It was used as a tea room and meeting place for the Oyster Bay Historical and Genealogical Society. The Coles sisters created a museum-like setting by furnishing the rooms in Raynham Hall with Townsend Family "relics". In 1941 Miss Coles gave the house to the Daughters of the American Revolution, who kept the house open as well as maintained the tea room. As upkeep became too burdensome, the DAR offered the building to the Town of Oyster Bay. In 1947 the Town took possession, making the decision to restore the original colonial house to its circa 1740 appearance. With the help of the Friends of Raynham Hall, incorporated in 1953, the building officially opened as a museum focusing on the historical events of the eighteenth century. 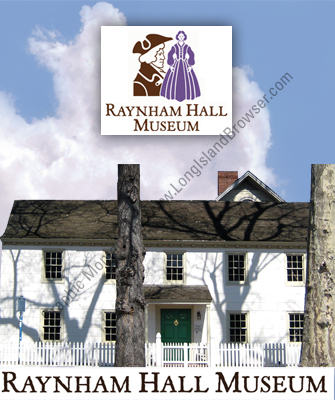 Raynham Hall was built circa 1738 as a two-story frame house with central brick chimney, gable roof, flush siding of wide boards and a five-bay façade with an entrance in the middle. The house contained four rooms, two on each level, with a garret or attic under the roof. The first floor consisted of a "hall" and "parlor" that flanked a narrow passage with a winding staircase built in front of the chimney. On the second floor were two "chambers" that corresponded to the hall and parlor below. Fireplaces opened into all four rooms from the central chimney. Around 1740, Samuel Townsend, who had purchased the property several years earlier, built a lean-to section on the north side, or rear, of the house. The addition, which increased the number of rooms to eight, included a kitchen and storage room on the first level and chambers above. The shed roof of the lean-to section extended the rear slope of the main gable roof, creating the distinctive "saltbox" outline. Architectural and documentary evidence suggest that at least one of the first-floor rooms featured wall paneling. The original parlor fireplace wall appears to have had paneling that extended from floor to ceiling as well as a decorative mantel and over mantel. The mantel, over mantel and parts of the paneling are today incorporated into one of the restored colonial period rooms. No substantial changes were made to the house during the remainder of the eighteenth century. The museum's collections include a pencil sketch of the house, dating to circa 1800, that shows a one-story porch extending the full breadth of the façade. The porch, which must have been added shortly before 1800, seems to be the only improvement made by the Townsends. The sketch clearly depicts the paneled Dutch door that is in place today and dates back to the mid-18th-century house. Today, the grounds of Raynham Hall Museum encompass two thirds of an acre, forming an oasis of beauty in the heart of the historic village of Oyster Bay. The gardens have been designed to correspond to the two historical periods represented by the house, the colonial and Victorian. Each is based on landscaping principles of the period and includes historically accurate plantings. The colonial garden, located at the front and west side of the c.1740 house, features brick walks bordered by daylilies and ferns, French lilacs and boxwood hedges, and ornamental elements such as teakwood benches. On the west side of the 1850's addition is the Victorian garden. Serpentine ivy beds combine with an assortment of rhododendrons, mountain laurels and white pine trees to create a picturesque effect. Ornamental features include a cast-iron urn in the center of a formal parterre outside the dining room bay window and a pair of urns on pedestals flanking a brick terrace at the rear of the garden. Free for service people and children under 6 years of age.